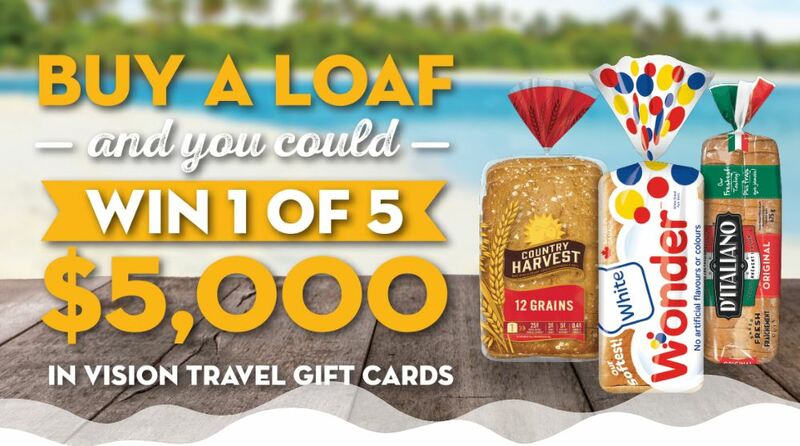 Enter the Co-Op Weston Buy a Loaf Travel Contest to get an opportunity to Win 1 of 5 $5,000 in Vision Travel Gift Cards. This contest is open only to legal residents of British Columbia, Alberta, Saskatchewan, Manitoba, the Kenora District in Northwestern Ontario or Yellowknife, NWT, who are the age of majority or older in their province or territory of residence. To enter you have to buy a loaf of any participating product and keep the receipt, then you need to register to the CO-OP promotions web page located at weston.cooppromotions.com by filling out the online entry form with your email address, desired password, name, last name, street address, city, province, postal code, age range, and the UPC of your purchase product. If you are already registered just sign-in to your account and enter the UPC code. There are 5 prizes available to be won, each consisting of a $5,000 CDN Vision Travel agency gift card. The Co-Op Weston Buy a Loaf Travel Contest begins on January 3rd, 2019 at 12:00:01 a.m. Central Time (“CT”) and ends on January 30, 2019 at 11:59:59 p.m. CT. The draw will take place on February 10, 2019. Winner will be notified by email or phone.